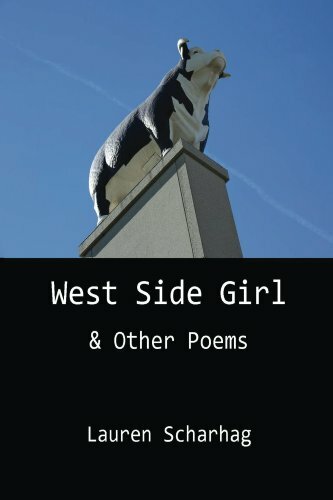 SUMMARY: West Side Girl is a collection of mostly biographical poems, written from 2005-2013. I focus on themes of family, food, womanhood, health, death, and my rather unusual heritage—Mexican-German. THE BACK STORY: Both my parents are first-generation Americans, my mother Mexican, my father German. Being born and raised between such radically different cultures has shaped me profoundly. The differences weren’t just cultural, either– there was also a classist element. My father’s family were well-to-do German intellectuals. My mother’s family was blue-collar, at best, with a long-standing criminal streak. Navigating those two worlds was often surreal and a bit overwhelming. Also, it’s been a struggle being considered a half-breed—I truly don’t know where I fit in. On forms that ask for my ethnicity, the options are usually “White (Non-Hispanic),” and “Hispanic (Non-White).” What do I put? I never know. Bi- or multi-racial is sometimes an option, but not a guarantee. Another issue is that I am very fair-skinned. I didn’t blend in in the barrio where I spent so much of my childhood, and I experienced a great deal of intraracial racism—I was treated better than my darker cousins because I was so white. I was constantly teased for having a weird German name. Ironically, even though my grandfather was himself born in Germany, he was very vocal against Mexican immigration. I used to find propaganda strewn around his house—flyers talking about why Mexican immigrants hurt America. It was very troubling and hurtful. Death is always a big subject in poetry. I was fortunate that I got to know my great-grandparents, but I had to watch them and my grandparents suffer through terrible health issues before they passed on. I lost my great-grandmother, step-grandmother, grandmother and my husband’s grandmother all in the space of a year and a half. It was a tremendous blow. I have also struggled with severe health issues myself—I’ve had chronic, intractable migraines since I was 7. I had endometriosis and PCOS, which resulted in a complete hysterectomy at 26. So a lot of these poems address mortality in that sense—physical pain, hospitals, and barrenness. I hate to perpetuate the notion that an artist must suffer, but in my experience, it’s kinda true. Food is one of the themes of this collection because it’s also been a central part of my life. Food bridges so many divides—it’s been a long-standing joke among Mexicans that no matter how much white people may hate us, they LOVE tacos. Everyone on both sides of my family love to cook and are quite good at it. The kitchen was always the heart of the house. I spent my teens and twenties grappling with these things, trying to forge a cohesive identity. These poems are a reflection of that struggle, as well as an exorcism. They are also the point where I felt like I had really achieved some competency as a poet. There are 48 poems in the volume, and 17 of them had been published. That’s really not a terrible batting average, but at the time, it felt like failure. I’m old enough to remember when all magazine submissions had to go through snail mail, which meant a lot of printing and postage costs. At one time, I had over 600 rejection letters! Publishing this book was my eff-you to the whole establishment. I was so fed up with the rigmarole of submission and rejection. Indie publishing was getting to be a thing, and I thought, why do I keep banging my head against the wall? If I want people to read my work, why not just DIY it? Then, for a while, I didn’t really write any poems at all. I basically almost gave up just when I started to get good at it. I’m back to it now, and I feel like I’ve grown so much. I have since moved on from autobiography and am trying to turn my gaze outward. I have stopped keeping and counting rejection slips. Perhaps not coincidentally, I get more published now. I’m also working on a new collection, and about to host my first open mic. Poetically speaking, I’m in a very good place right now. WHY THIS TITLE? : The title refers to Kansas City, MO’s West Side, which is historically the Hispanic neighborhood. It’s where I spent my formative years and attended Catholic school. The bull photo on the cover is the Hereford bull, a statue on the downtown bluffs overlooking the West Bottoms, on the banks where the Missouri and Kansas Rivers meet. WHY WOULD SOMEONE WANT TO READ IT? I believe a poet’s job is to make uncommon experiences accessible to everyone, to achieve universality—and to do so in an artful way. I think everyone, at some point, has felt as though they don’t belong, so even if you can’t relate to my specific situation, you can understand what it feels like to be shunned or alienated. Everyone has to deal with illness and death at some point in their lives. Everyone loves food. Barring that, I hope that if we have nothing in common, I hope I have given the reader insight into something new; that I have, in some way, enriched their life. AUTHOR PROFILE: Lauren Scharhag is the author of Under Julia, The Ice Dragon and The Winter Prince, and the co-author of The Order of the Four Sons series. Her work has appeared in multiple magazines and anthologies. She is the recipient of the Gerard Manley Hopkins Award for poetry and a fellowship from Rockhurst University for fiction. When not writing, she can be found hanging out in prisons or embarking on art pilgrimages. A recent transplant to the Florida Panhandle, she lives with her husband and three cats. AUTHOR COMMENTS: In additions to the reasons I gave above for why people might want to read these poems, the story of the child of immigrants seems very topical right now, with the issues surrounding immigration, refugees, and Trump’s wall. Satan doesn’t have to come to me. I’ll go to him. I am too impatient for the bottle. It takes an insect heart to catch an insect heart. I will return, a hero, to the worms. Every 27 days you grow new skin. to ease the weeks of your fast. Enough water in this body to slake the thirst of a pair of desert sojourners for a day. 1,000 skins in a lifetime. Let us talk of beauty and the relative nature of depths and shallows. Three layers we’re constantly trying to plumb to get at the person within. one-sided beast beating the bars of its ribcage. and that’s why it’s so hard to breathe. Tiny motes that drift around our room are pieces of us. this release of flesh, piling up in corners and collecting on bookshelves. to pick his own poison. The skin is considered the largest organ. this amygdala. I am the memories it stores. I am breath. I am a voice. sleep tales we tell ourselves like Scheherazade to vouchsafe our happiness. uterus, spleen, and get to the meat of the matter. You’d be amazed at what can be waylaid, what can be traded away or given freely. Scars form anytime we are damaged beyond the first layer. but we won’t settle for anything less than soul and bone. only the essential us. Three hundred million cells are dying inside as you read this. the joining of palms, a connection at the place where the skin grows the thickest. Pale and transparent as skim milk. I can never go home. And I think, Of course. He’s right. He’s always right when I don’t want him to be. And I to endure the pain of being seen. After all, my skin is his skin. And I am the break in the rosary beads. The hill, which I can never go back to. Instead, I toe the thirty-mile mark. And hurried to cover up my whiteness. And the neighbors ask who the white girl is who comes and visits. Someday, I will take a grater to my skin. I shall cast it off. Flayed, I shall anoint myself with cominos and cilantro. In blood I shall make my pilgrimage. On the Boulevard, I shall hail, Marìa.